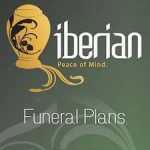 Iberian Funeral Plans are a fully registered and operational Spanish SL Company with a Head Office in Malaga, regulated by The Ministry of Economics in Spain. Contracts are in place with leading English speaking Funeral Directors, with local offices and representatives, 24 hour English speaking bereavement telephone number. All plans are dual certification, which means the plans are operative wherever you reside (though we have had contradicting comments one that and other issues, which has downgraded their score). The prices are fixed on the day of joining and are inflation proof according to Iberian. BBVA Bank in a Funeral Directors Account (FDA) and remain in Spain to ensure security and availability of funds to cover the cost of the service and wherever it may be, thus ensuring your estate is not subject to extra cost. euros or sterling. There is no interest charged on our plans and they can be taken over a maximum 5 year term at an affordable amount convenient to you. Should death occur before the plan is fully paid, a closing statement will be prepared and settled by the estate following the provision of the Funeral Directors services. Beech Plan which is a traditional cremation with all of the necessary legalities for the funeral to take place. This plan includes two days mortuary expenses and no church service. Oak Plan A complete repatriation service with the transfer of the deceased to a Funeral Director of your choice within the UK or other European country. The Funeral Directors professional services including provision of the necessary staff, all legal documentation for the funeral to take place. Conveyance to the local Funeral Directors premises. All legal documentation and administration necessary for the repatriation of the deceased to a Funeral Directors premises of your choice in the UK or any EU country. Supply of a Zinc lined hermetically sealed coffin. Contribution towards overseas burial are equal to cremation costs. Worldwide help and assistance if death occurs in another country.